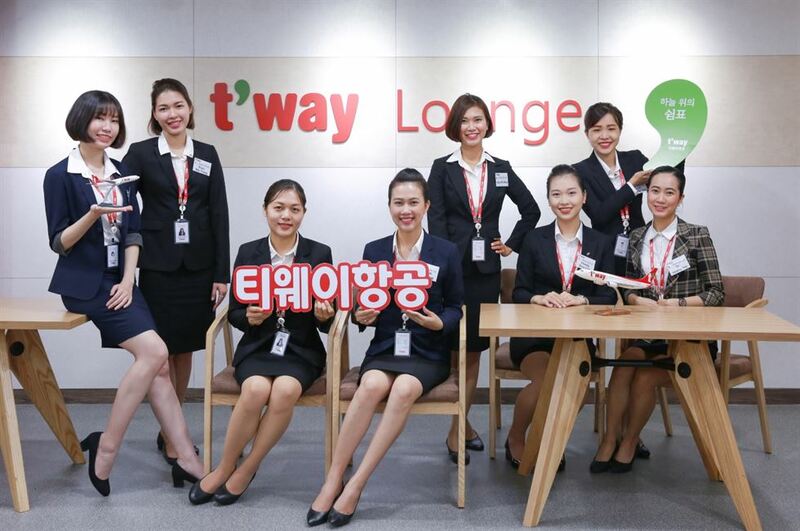 T'way Air has established itself as Korea's most innovative low-cost carrier over the past eight years, introducing a range of new passenger services and breaking industry norms to create a more employee-friendly workplace. For its workers to focus more on passenger safety and stop wasting their time doing their hair, the company became the country's first carrier on May 8 to allow its cabin crew to freely choose their hairstyles. In the past, the budget carrier's female flight attendants were required to either tie their hair back or wear their hair in a bob. Still, many domestic airlines require cabin crew to strictly maintain their hair to company specifications. This is one of many changes T'way CEO Jeong Hong-geun has taken, in line with its corporate management philosophy that prioritizes the personality of each employee. Since December 2015, he has led the Seoul-headquartered company which operates flights departing mostly from Daegu International Airport. T'way's flight attendants are also allowed to wear six types of uniforms, as they can choose among a basic two-piece suit consisting of jacket and skirt, one-piece dress and pants, all of which are in two colors. "We respect each employee's ideas and actively adopt their thoughts in our business," Jeong said in a recent interview with The Korea Times. "We've sought to develop a horizontal corporate culture, rather than a hierarchical organizational culture, to make our decisions faster than older companies do." Considering the flagship carriers in Korea have faced sharp criticism for alleged tyranny of their owner families, the eight-year-old company's organizational culture may be considered to be exceptional in the nation's aviation industry. "I prefer employees who can briefly explain their ideas to those who make presentations with Microsoft PowerPoint," Jeong said. "Our employees can also reject my opinions in meetings, regardless of my position as the CEO." T'way's preference for swift and democratic decision-making has led the company to grow rapidly with various optional services that its rivals have followed. The budget carrier posted 47.7 billion won ($42.2 million) in operating profit in the first half of this year, up 130 percent from a year earlier. The record-high operating profit exceeds last year's operating profit ― 47.1 billion won. As the company posted 366.2 billion won in sales in the first half, up 30 percent from a year earlier, its operating profit to sales ratio reached 13 percent, which is the highest figure among those of listed domestic low-cost carriers including Jeju Air and Jin Air. Jeong attributed the achievement to T'way's differentiated services that its customers have praised. T'way is the nation's first low-cost carrier to come up with service bundling, offering services for additional checked baggage, advance seat selection and advance reservation of in-flight meals for sale as one combined service package. The CEO also cited its flight booking system for group tourists, differentiated airline meals and in-flight duty free shop as additional factors that enabled the rapid growth. According to T'way, it is the nation's only budget carrier to run its own duty free shop in the air. "It actually takes a certain amount of time and effort to examine plans to introduce new services," Jeong said. "Once T'way decides to offer new services, however, other air carriers benchmark us, because they know the excellence of our services." Earlier this month, T'way was listed on the main KOSPI bourse, taking another leap. Although the stock price has been lower than expected due to unfavorable factors in the industry, such as the global trade war and rising exchange rates and oil prices, T'way said it views the market from a long-term perspective. "Unlike many investors on Yeouido, who tend to want profits on short-term trades, foreign investors recognized us for our differentiated strategies, saying we have competitiveness in the long run," Jeong said. T'way has a long-term plan to set up foreign subsidiaries, as the Malaysia-based low-cost carrier Air Asia did. The world's largest budget carrier has subsidiaries in the Philippines, Indonesia and Thailand. The Korean firm expects to open local subsidiaries within 10 years in Japan, China, Taiwan and Vietnam. It regards the four countries as key markets with high potential for growth. "Too many players are vying for leadership in the Korean market, which has already reached the saturation point," Jeong said. "If we establish foreign branches, we can operate domestic flights through the subsidiaries headquartered in each country. This will allow us to grow further." The chief executive's career, built in Japan, is expected to be helpful in establishing the local branches. He served as head of T'way's Japan office in 2015. He was also a Korean Air branch manager in Nagoya when he worked for the nation's largest air carrier. According to T'way, several foreign airlines including those in Japan have asked T'way to set up joint ventures with them in their countries. However, Jeong said his company refused the offers, because it needed more time to prepare for overseas expansion. As a part of these efforts, T'way recently hired eight Vietnamese flight attendants. Before then, Korea's low-cost carriers had never employed foreigners as their crew members. The new employees began getting their eight-week on-the-job training July 16, which is the same as that for Korean aircrew. They are getting the training in English. T'way also added English to its manual after hiring them. The flight attendants will mainly offer services to Vietnamese customers on planes coming from Ho Chi Minh City to Incheon. "We recruited the employees in Ho Chi Minh City, but many applicants came from Hanoi and other regions," Jeong said. The chief executive said his company plans to employ additional cabin crew in other areas in Vietnam, as well as pioneering new routes for the country's rapidly growing market. He expects the flight attendants speaking Vietnamese will provide more convenient services to passengers from the Southeast Asian country. 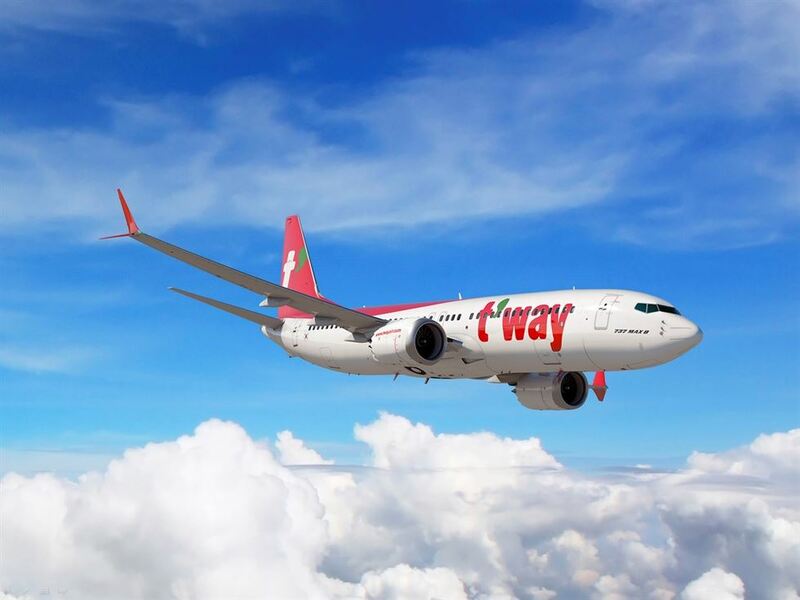 T'way aims to be the nation's first low-cost carrier operating flights with medium- and large-size aircraft to Europe and North America by 2025. Before achieving this goal, the company will come up with various medium-distance routes to Phuket, Kuala Lumpur, Singapore and Bali. It will buy four new aircraft by the end of this year, and will introduce 10 B737-MAX 8, Boeing's next new airliner, to the Korean market by 2021 for longer flights and cost reduction. The aircraft has better fuel efficiency than Boeing's previous models. "With development of new routes and purchase of the B737-MAX, we will target niche markets," Jeong said.